A warrior can be fierce, but also wise and kind. Donna graduated in the top 1% of her class from Southwestern University School of Law in May 1994. She was Certified by the State Bar of California as a Family Law Specialist in November 2000. She has been practicing in all aspects of complex family law matters for over 20 years and has sat as a “Judge Pro Tem” or temporary judge in numerous family law and domestic violence courts in Los Angeles County since 2005. She has lectured extensively for the State Bar of California, the Los Angeles County and San Fernando Valley Bar Associations and the Association of Family and Conciliation Courts on various issues related to family law. 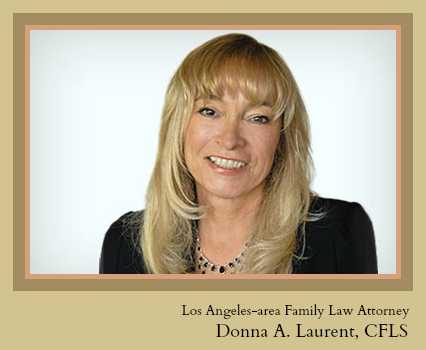 Donna has also been a volunteer family law mediator and settlement officer for the Los Angeles Superior Court for many years. Prior to law school, Donna earned a B.A. in Drama from the University of Virginia and spent several years acting professionally in various theater companies. Thereafter, she eventually worked her way up to becoming the Director of Acquisitions for a private real estate developer and owner of multi-million dollar manufactured housing communities located throughout the U.S. She held that position for several years and was directly responsible for the acquisition and purchase of properties valued at over $50,000,000. This unique background provides Donna with skills that she creatively utilizes in both courtroom advocacy and in analyzing complex financial issues. After her first year of law school, Donna began volunteering in the Los Angeles Superior Court Domestic Violence Clinic, which was administered by San Fernando Valley Neighborhood Legal Services (NLS). She has continued to aggressively advocate for domestic violence victims for more than 20 years and has a particular expertise in this area of family law, including the effects of trauma. She has guest lectured on this subject on numerous occasions. Donna served as the President of the Board of Directors for Haven Hills, Inc., one of the largest domestic violence shelters and programs in Los Angeles County, from 2014 through 2017. She currently volunteers as a practice judge for the Family Law Appellate Project, which prepares pro bono attorneys for oral arguments in appellate cases involving domestic violence issues. In addition, Donna is highly experienced in the representation of parents who have “non-typical” children with “special needs”, including children with autism and autism spectrum diagnoses, bipolar disorder, dyslexia and other learning disabilities, ADHD, neurological, developmental and other physical delays and challenges. She brings personalized knowledge, empathy and an ability to develop and implement individualized parenting plans that best suit the unique needs of these children to their families. Donna is also active in local bar association activities. She has been a member of the Family Law Executive Committee of the San Fernando Valley Bar Association (SFVBA) since 2002. She is a former Co-Chair of the Family Law Section and of programming for the section. She has chaired the bar’s “Unbundled Legal Services” and Lawyer Referral and Information Services (LRIS) Committees and been a member of the Bench/Bar and Diversity Committees. She is a former SFVBA Board of Trustee member. In her free time, Donna enjoys practicing meditation, yoga and flower gardening.